The results are in. 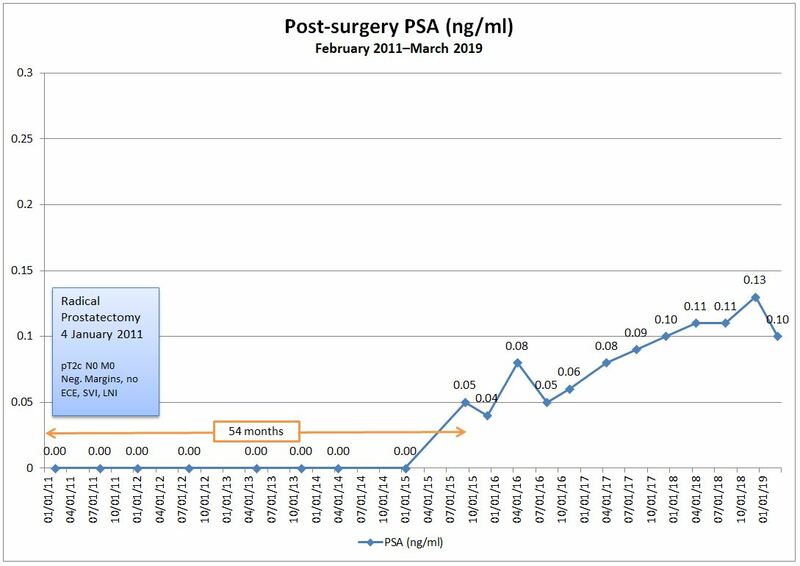 My latest PSA is 0.08 ng/ml, up from 0.06 ng/ml in December. That’s exactly where the trendline on my geeky spreadsheet graph told me it would be, so I’m not entirely surprised. Not pleased, but not surprised. What does all of this mean? Who knows. On the good news side, I’m still well below the historically accepted 0.2 ng/ml cancer recurrence threshold. But I’m at the point now where I can no longer convince myself that these elevated PSA readings were just a byproduct of the change in PSA test methodology in March 2015. I’m sensing that something real is afoot here, and it doesn’t bode well. My appointment with the doctor isn’t until 9 May 2017, so I’ll have plenty of time to think about this in advance and have a battery of questions ready for him. We’ll see if we’ll stick to the four-month test cycle or if he wants to increase the frequency. 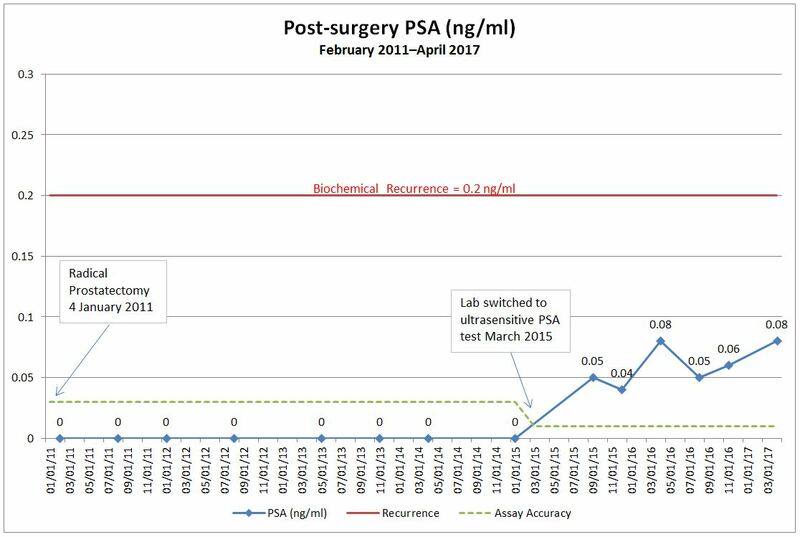 If we stick to the four-month cycle, my trendline would predict the next PSA to be between 0.09 and 0.1 ng/ml. I’m not going to pretend that this isn’t troublesome for me, because it is. But I also know that it’s still too early to go into full panic mode. If we stick to the four-month test schedule and August’s results come in at 0.07 or above, that will be one more data point to reinforce the notion that the cancer is, in fact, on its way back. At least in my mind. If it comes in less than that, I’ll be both happy and frustrated because of the continued uncertainty as to what’s really happening. The journey—with its sometimes insufferable waiting—continues. Hi Dan, stay positive, you have a lot going for you. The main one is time. Things are changing out there, so we still hope for a magic bullet! My oncology always tells me to do what I enjoy!